Get acquainted with some of Paris’s many iconic sites, including Notre Dame and the Eiffel Tower on a panoramic city tour. 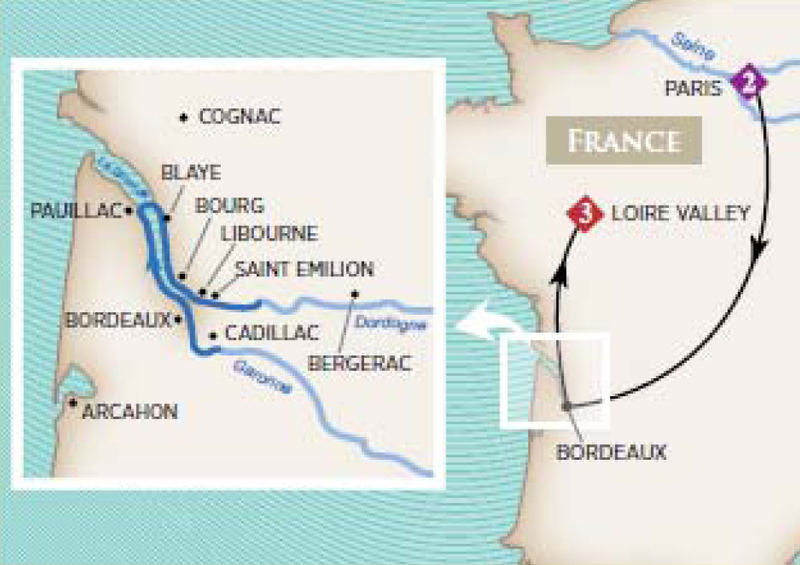 Check-out of your hotel and board a TGV train that takes you to the legendary land of wine, Bordeaux, where you’ll board your luxurious ship. Pauillac, a lovely village on the Left Bank of the Gironde Estuary, is the gateway to the famed Médoc region renowned for producing some of the world’s finest Bordeaux wines. You will see some of the most beautiful and famous wine estates, including Château Latour, Château Mouton Rothschild, Château Lafite Rothschild and Château Pichon Longueville. 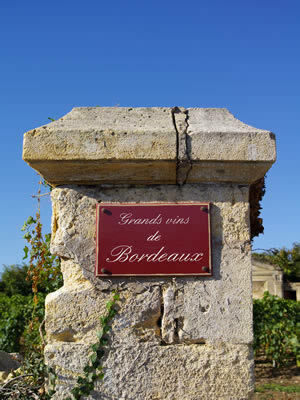 You’ll then visit either Château Gruaud Larose or Château Léoville Poyferré for a tasting of Grand Cru wines. For a more active excursion, take a bike ride from Blaye through the idyllic French countryside. Alternatively, visit a prehistoric cave, Pair non Pair, offering one of the best examples of art made by prehistoric man. During the afternoon, you can cruise to Bourg or join a bike tour along Santiago’s path—a famous pilgrimage route—to Bourg. While in the ancient village of Bourg, visit the Carriage Museum, which houses a wonderful collection of horse-drawn vehicles and then explore the underground passageways that lead you to the immense oil tanks from the Second World War. Later in the day, experience the hospitality of this charming medieval village with an exclusive wine festival complete with live French music, dancing, wine and hors d'oeuvres. Libourne provides a gateway to one of Bordeaux’s most elite wine regions, Saint-Émilion, known for its picturesque architecture, monuments and celebrated vineyards. Join an excursion to historic Saint Émilion, and while here, explore the monolithic church carved out of one piece of limestone rock, and then go under the church to discover its catacombs and caves. Afterwards, enjoy a wine tasting at either Château de Ferrand or Château de Pressac. Prefer a more active adventure, pedal through the vineyard-rich countryside to Saint-Émilion and then to Château Soutard for a Grand Cru Classé wine tasting. Tour the magnificent Château Vayres, one of the most prestigious historic buildings of Aquitaine, or spend time discovering the Bastide town of Libourne and then stroll through its colorful open-air market tasting some of the region’s specialties. For a more active exploration of the countryside, enjoy a hike followed by a wine tasting. Later in the day, you can visit Fronsac, where you can taste some of the regional wines at a grand wine cellar; or if you missed the countryside hike in the morning, you can do it in the afternoon, followed by a wine tasting. The breathtaking capital of the wine world, Bordeaux is a UNESCO World Heritage Site and classified as a “City of Art and History.” You’ll have an opportunity to experience much of the rich culture and architecture on a city tour followed by a visit to the Bordeaux Wine Museum, housed in an awe-inspiring building. Visit three of the Loire Valley’s regal châteaux starting with the Château de Chenonceau, one of the most beautiful castles in France. This châteaux has been referred to as the “Women’s Castle” since it is the only castle in the region that has been built, inhabited and saved by women during the Renaissance. Château du Close Lucé was Leonardo da Vinci’s last home where he completed some of his most famous works under the patronage of the King of France. The Château d’Amboise, perched on a promontory overlooking the Loire River, was the first Renaissance château built in the Loire Valley and features extravagant residences, gardens and a Gothic chapel, where Leonardo da Vinci is buried. En route to Paris, visit two more majestic châteaux. While Château de Chambord, located at the heart of Europe’s largest enclosed wooded park, began as an unassuming hunting lodge, it is now the biggest château in the Loire Valley with 426 rooms, 77 staircases and 282 fireplaces. Next, marvel at the residence of seven kings and ten queens of France at the famous Château de Blois where you'll discover the secrets of the French court. Afterwards, transfer by motorcoach to your hotel at Charles De Gaulle Airport.